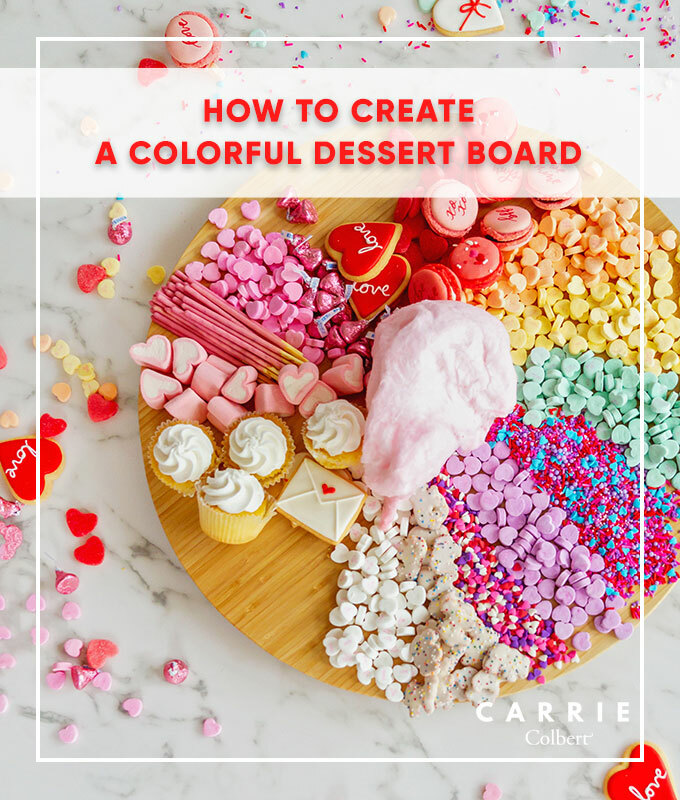 You'll love this colorful and delicious dessert board! You know we love a great, full, delicious cheese board. It’s always a great idea when entertaining guests as well. What’s not to love? Easy to create, pretty to look at, and tasty for everyone! 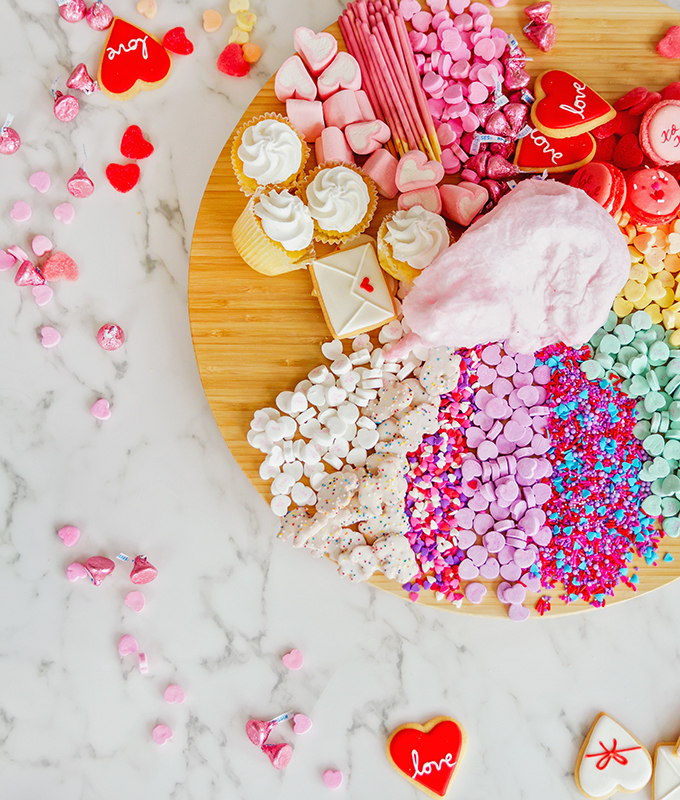 But have you ever created a dessert board? It might just be our new favorite thing. Over the holidays, Jenny created a Christmas inspired dessert board that we all fell in love with! After that, we were determined to have her create one with us for Valentine’s Day. So, we present to you our colorful (in rainbow order of course! 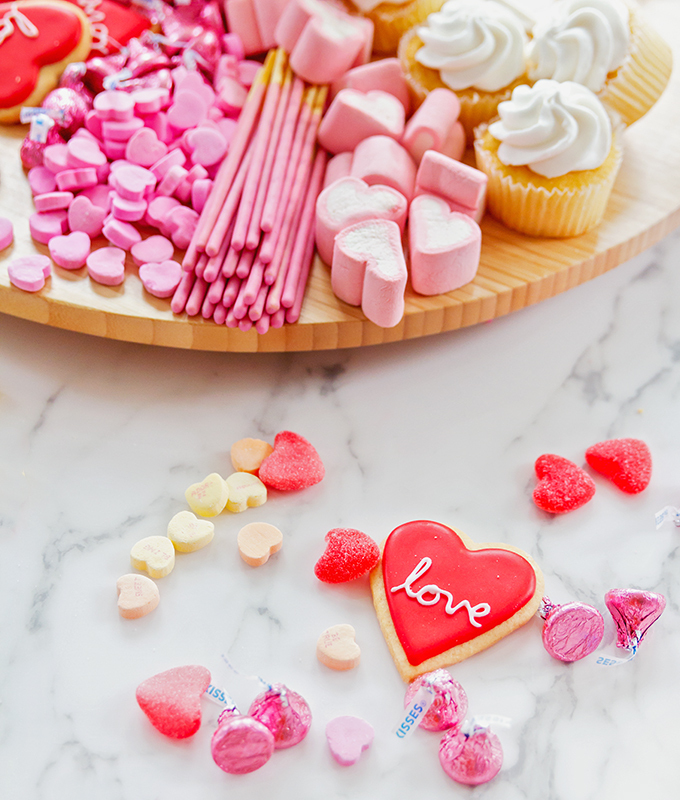 ), delicious, Valentine’s Day dessert board! 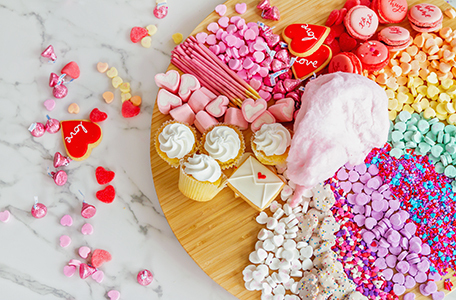 Now, don’t get us wrong – this dessert board concept could easily be made and enjoyed year round, but we adore the idea of working around a theme or holiday. After all, we’ve never met a theme we didn’t love! 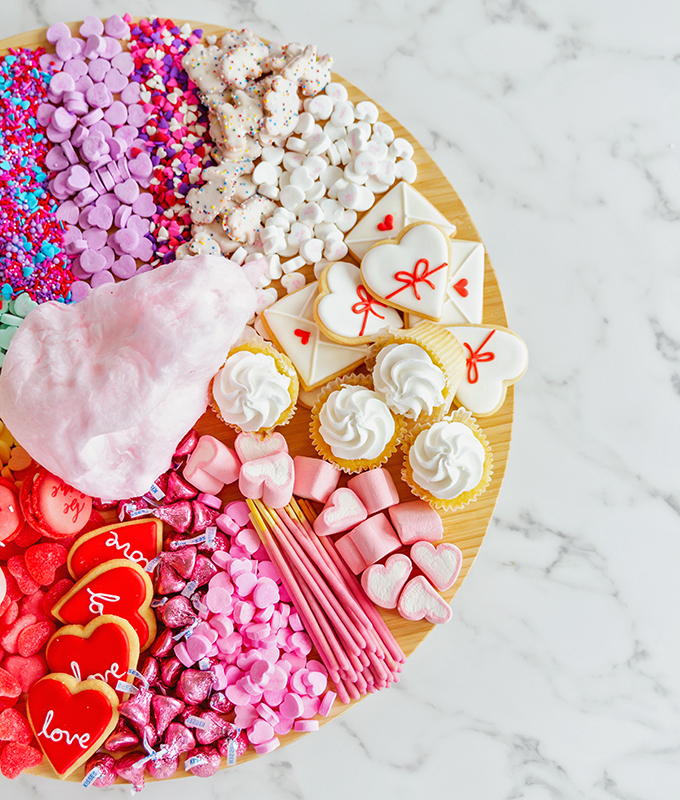 As you saw earlier this week, we created a Valentine’s Day bar cart, and this dessert board is a great complement to it. 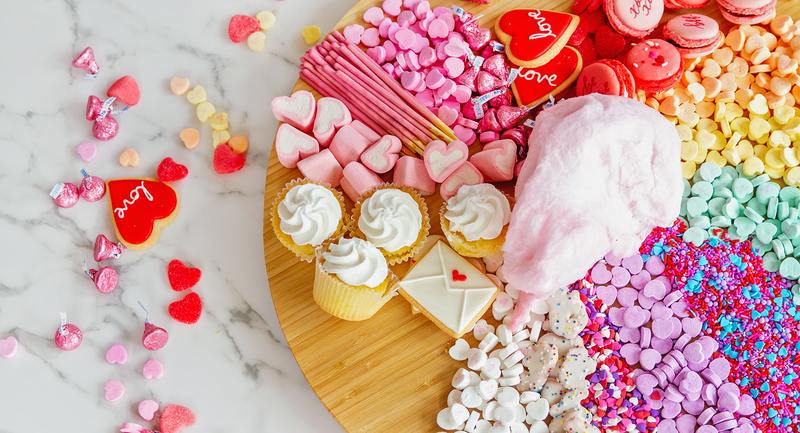 Round up your girlfriends, pop some rosé and load up on all your favorite sweets for a Galentine’s soirée. 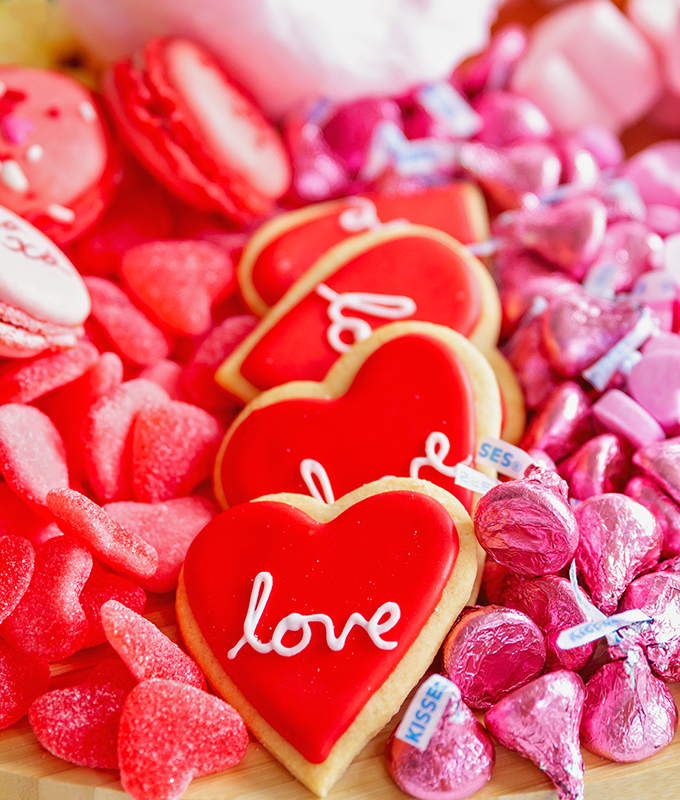 Grab all your favorite sweets and candies. 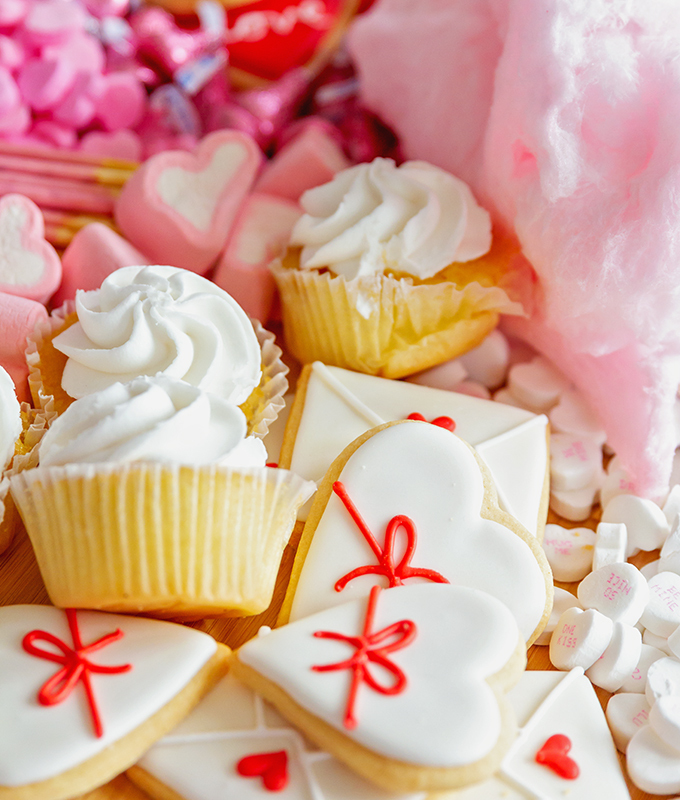 There are no rules… the more the better – it is dessert after all. 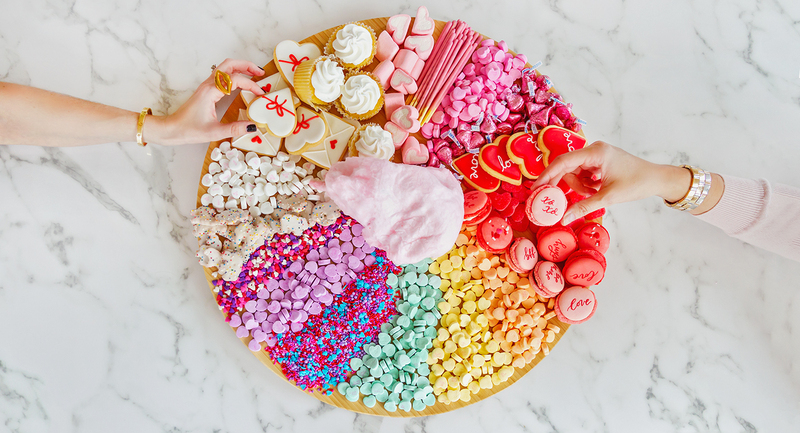 Our dessert board is a Valentine’s inspired dessert board so we stocked up on some of the Valentine’s classics like conversation hearts and Hershey kisses and then some of our all time favorites like macarons and cupcakes. 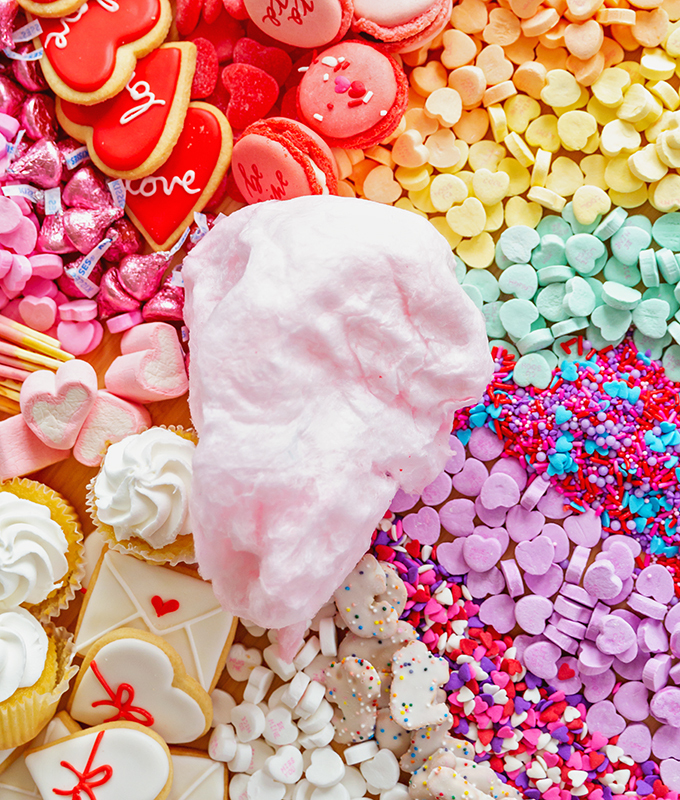 Organize your dessert board ingredients by type or color. 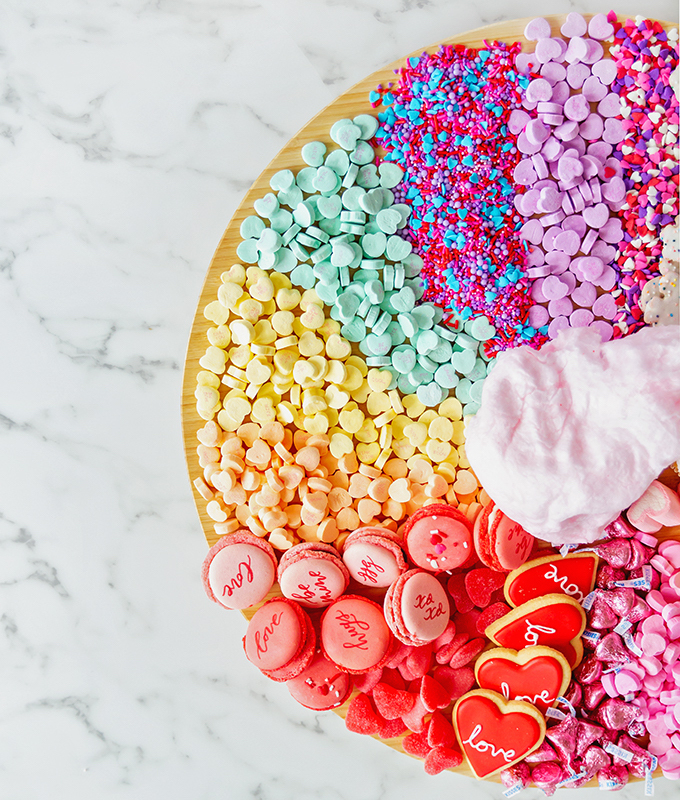 You know we’re a sucker for rainbows (see our rainbow cheese board here) so we grouped our ingredients by color in a rainbow arrangement, but with a twist on the primary colors for a brighter finished product that utilizes the Pantone color of the year. 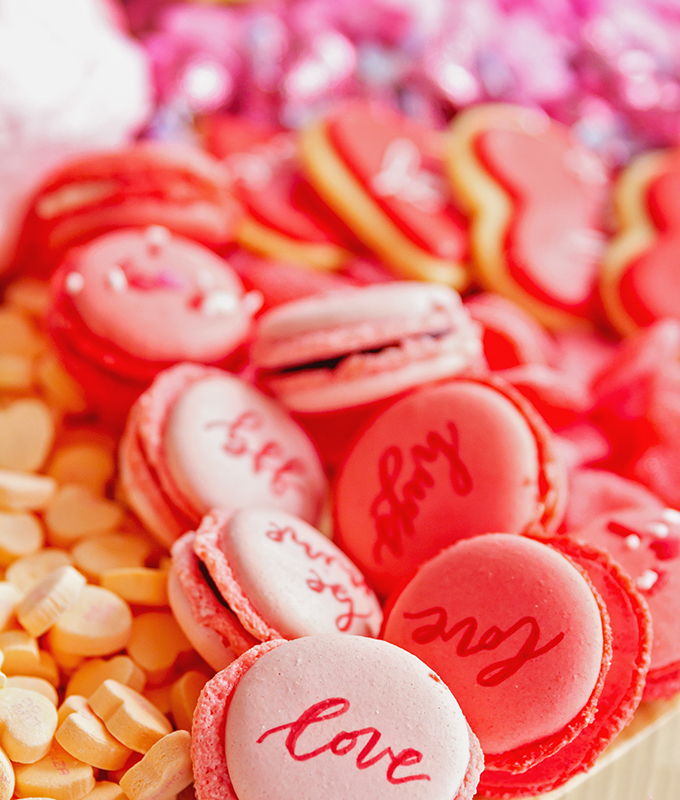 We worked with the talented Kristara to personalize some of the macarons on the dessert board for Valentine’s Day by writing on them with edible paint and she also created the fun coasters with names of our party guests. Are you going to create your own dessert board? If so, be sure to tag us so we can see your creations. 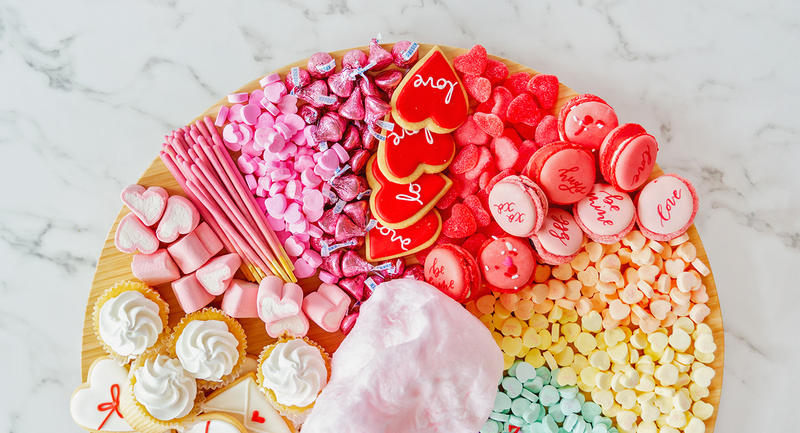 And don’t forget about our conversation heart cookies from last year. We are still absolutely obsessed with them! Colorful stripes + casual denim for the win!